This is a depressing exposé of some terrible practice and ethics, in some key publications in the crypto space. We all know that much media in this industry falls into the ‘pay-to-play’ category, but surely blockchain is supposed to be all about transparency? From a journalistic point of view this is really shocking and disappointing. And from a writer-for-hire point of view I am also in a position to compare the rates paid to create this stuff, vs what the client gets charged… I am starting to wonder if we’re in the wrong business here? 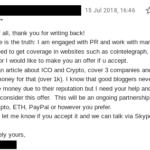 No, we’ll hold on to BlockSparks’ (and Crypto Confidence Podcast’s) integrity I think, making terms of engagement and reward clear at all times.